This study presents a historical view of Eucharistic concelebration, the unity of every priest in the one priesthood of Jesus Christ, and theological and pastoral considerations for concelebrants. 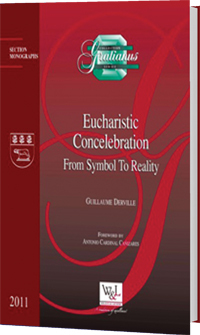 "[This book] invites us to rediscover in every Eucharistic celebration, with the force of the Holy Spirit, Christ present in his sacrifice realized upon the altar. Concelebration, like every Mass, is a divine action in which the Church praises God the Father, to enter in the great mystery of the Trinitarian love: we turn towards our Creator and Redeemer who deifies us and sends us forth so that with his fire we might consume the whole world."